Once the weather gets warmer, it’s hard to beat a nice Sauvignon Blanc. Done right, the balance between fruitiness and acidity is perfectly refreshing. Sadly, most inexpensive Sauvignon Blancs either have no flavor, or basically taste like sweet fruit juice. 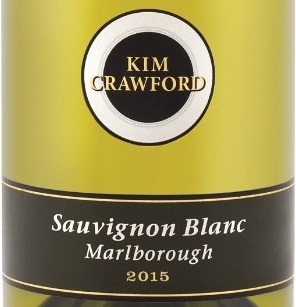 Kim Crawford’s Sauvignon Blanc is a happy exception, and delivers perfect flavor at a very reasonable price. First, some history. If you’re going to try Sauvignon Blanc, make it one from New Zealand. This is the grape that put NZ wines on the map, and they’ve enjoyed worldwide prominence since the 1990s. Kim Crawford is known for some of New Zealand’s finest wines, and this is a great example of Sauv Blanc, with nice aromas of citrus and fresh grass, and juicy flavors of key lime, honeydew melon, and pink grapefruit. What makes this wine really work is the crisp, mineral finish. You need to balance powerful fruit flavors like this with a crisp, dry finish, and this wine has that in spades PLUS a mouth-watering acidity which keeps the flavors perfectly balanced, and refreshing. This wine used to be available everywhere for around $15, but the last few years they have routinely gotten 90+ scores in blind tastings, so the price has gone up a few dollars. Still, at less than $20 a bottle, it’s well worth it. On my five-cork scale based on taste and value, I give the 2015 Kim Crawford Malborough Sauvignon Blanc 4 corks.